Awesome Marble Combo with Two Slide Lanes! Description: One of our newest additions. 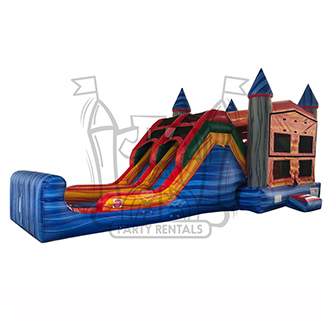 This new Marble 5-1 inflatable combo features a dual lane slide and a basketball hoop inside. Its marble colors are sure to get everyones attention. It requires a 30' Long x 17' Wide x 15' high space. This awesome combo cans also be used wet for an additional fee.